Exploring a Fleece: Grading and Sorting | carpe diem! 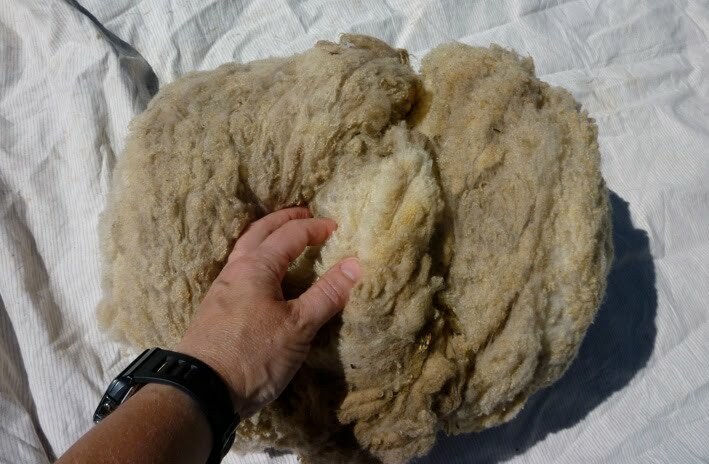 Confession time: although I’ve done a lot of research about grading and sorting a spinning fleece, enough that I feel I should know how to do it, I’ve only dealt with two fleeces in my spinning life. I’ll share my experience of the third fleece with you, in hope that it helps someone as nervous as I was when I unrolled my first fleece. If that’s you, take heart: it’s less difficult than you might think. And, as Beth of The Spinning Loft says, “The sheep are growing more even as we work”. There will be another fleece along shortly. 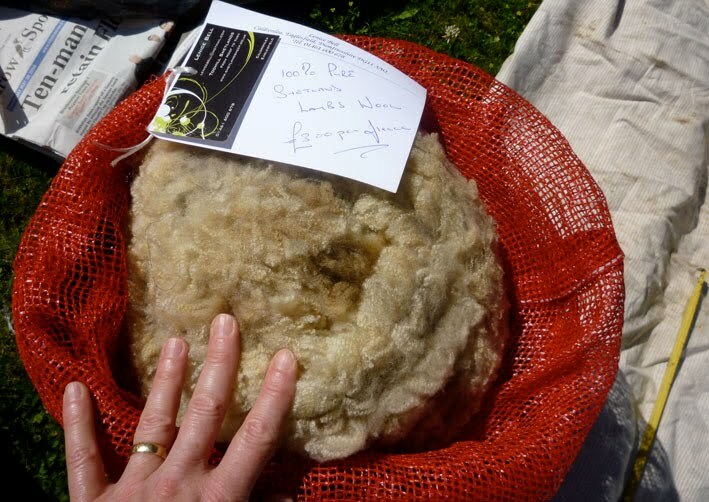 Sitting in its bag in the sunshine is one of my Woolfest 2010 acquisitions, a Shetland lamb fleece from Lenice Bell, Todhill Shetlands. 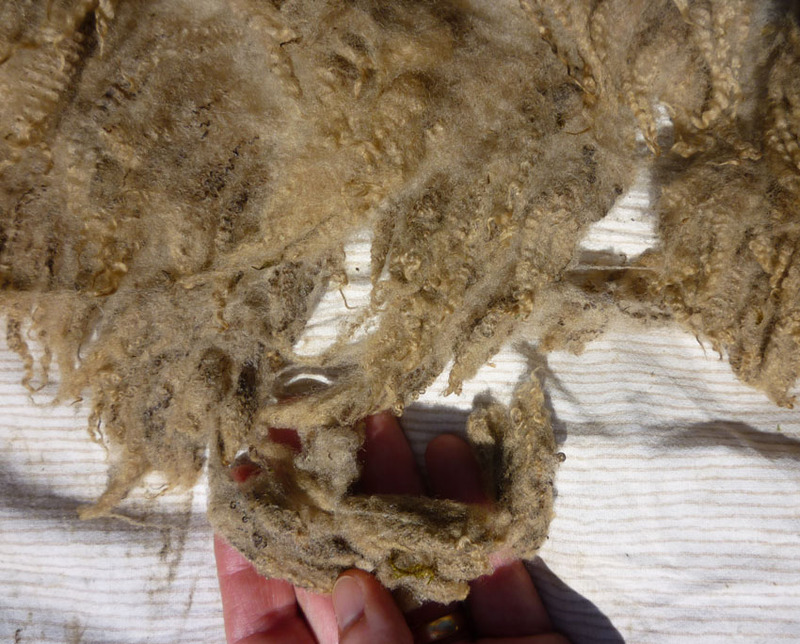 It’s a spinners’ fleece, thoroughly skirted, so I don’t expect to find any dags (dried lumps of manure) hanging from the edges. 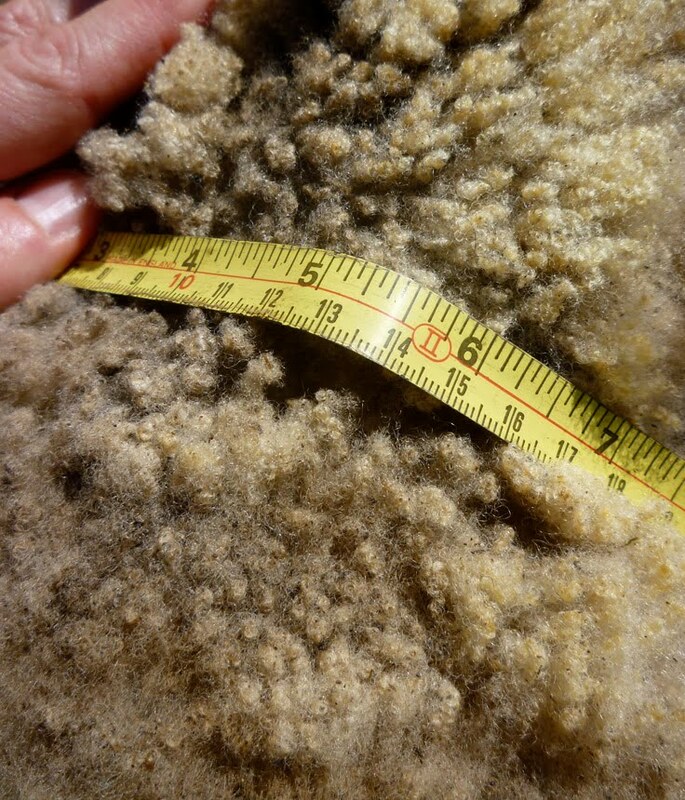 It’s important to encourage farmers to sell clean, well-skirted fleece: you may not mind removing the dags, but dried sheep dung poses a much greater risk to animal health than does clean raw fleece. This lamb lived in Scotland, I bought the fleece in Cumbria, I’m dealing with it in East Anglia and I plan to send some of it overseas: if by chance there was a harmful organism in the fleece, I’ll have done it a great favour (and farmers a great disservice) by moving it across the country so quickly. It might seem that this is a lot of fuss about next to nothing, but having lived in the UK through the Foot and Mouth epidemic in 2001, I will do everything in my power to minimise the chance of that happening again. Ever. Anywhere. 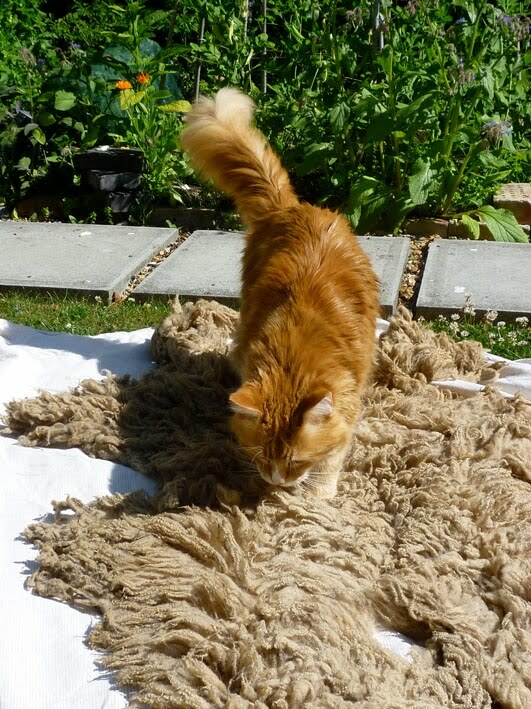 If any of this fleece contains dried dung, I’ll remove it carefully and dispose of it safely. Traditionally spinners use it as mulch, but I’ll bury it deep in the bean trench or compost bin where it won’t surface for at least 18 months. If I didn’t have a garden I’d put it in the non-compostable rubbish. I don’t want birds or other animals moving dirty fleece out into the wider environment, just in case. The rolled fleece is intimidating. Where’s the way in? 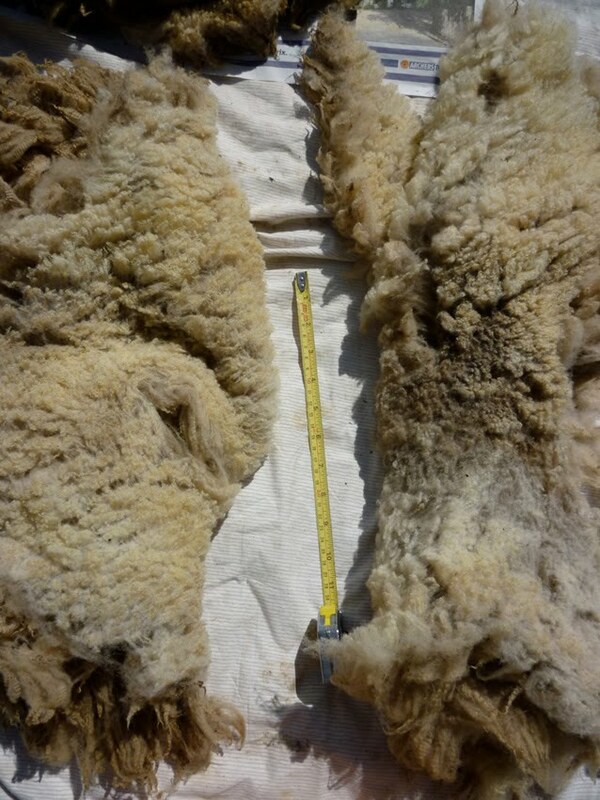 Fortunately I know that the British Wool Marketing Board (hereafter BWMB) approved method of rolling fleeces is staple side up/cut side down, sides to the middle, roll from back end to front, pull the neck out into a long strip and wrap/tuck it under itself to hold the roll closed. Here I’ve just found the bit of the neck that’s tucked under. 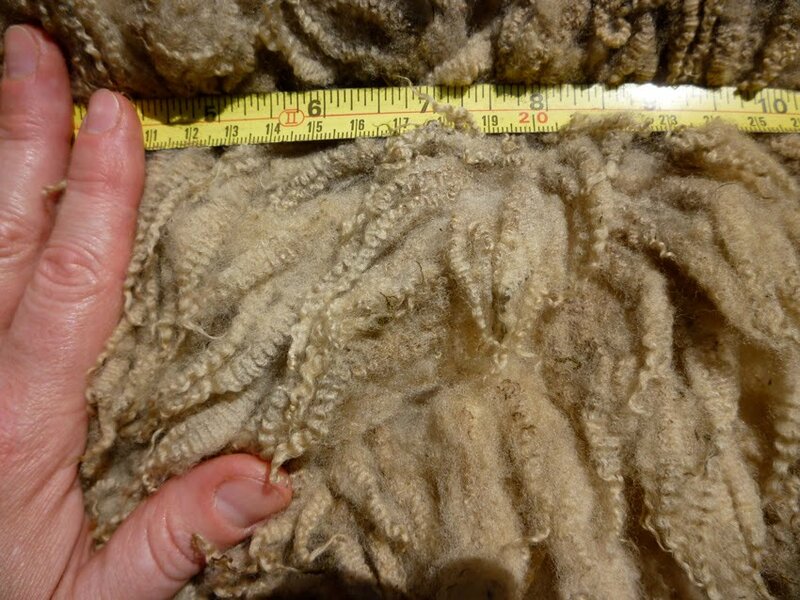 Furthest from the camera, beyond the tape, the upper surface of the fleece is greyer, dirtier, with the tips of the staples gathering into pointy bits. This side of the tape you can see the underside, paler, cleaner, creamy in colour, with drops of golden lanolin, and the staples breaking naturally into rows. If you ever had long hair, you may remember that even after it was combed into a beautiful flowing sheet of hair, it would break/clump into long locks. 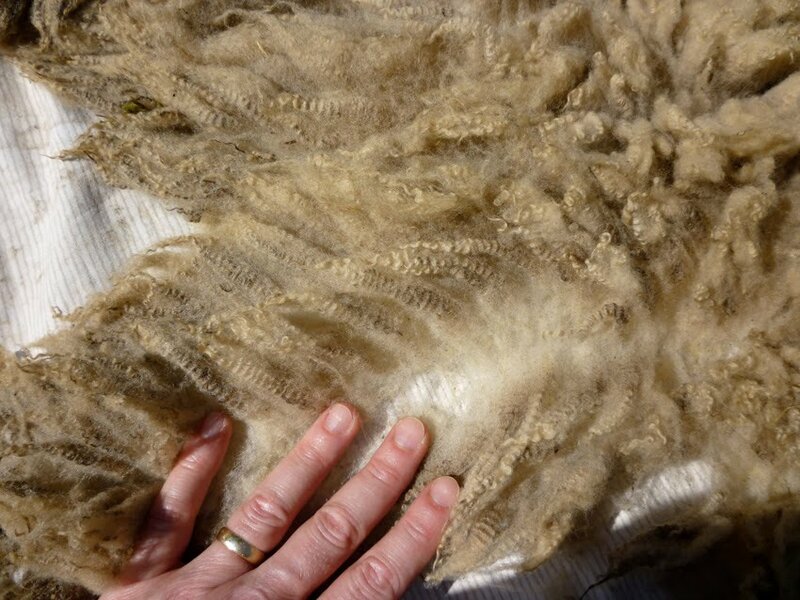 Fleece is the same, clumping naturally into what are known as locks in longwools and staples in fine wools. 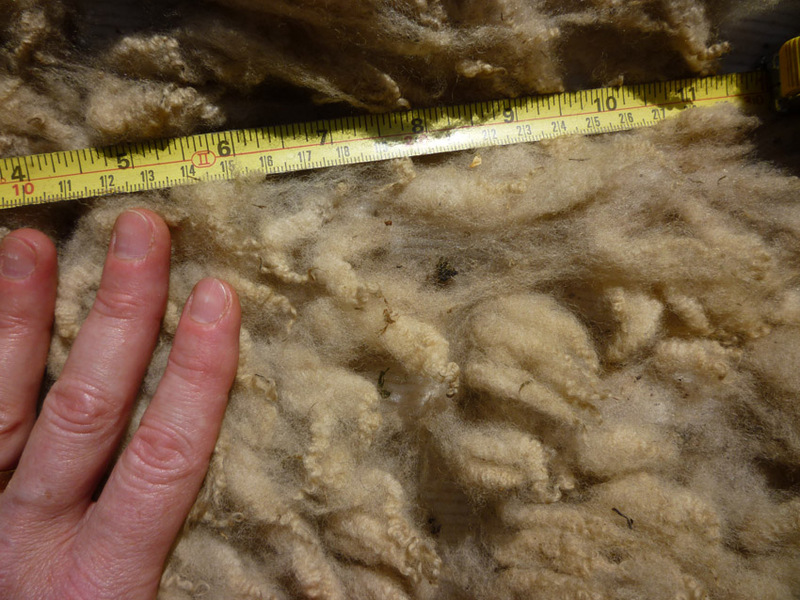 One thing I can’t show you on this fleece is what are known as second– or double cuts, short (1-1.5″) tufts on the underside of the fleece that result from the shearer cutting a bit high, then going back over the same area and cutting lower down. 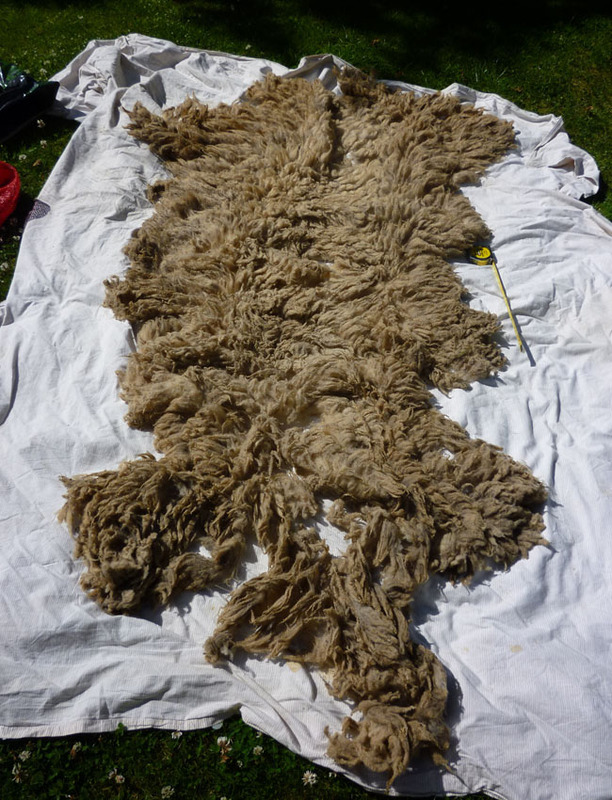 The sheep looks tidier for this, but those second cuts must be removed or they can form nepps when you process the fleece. 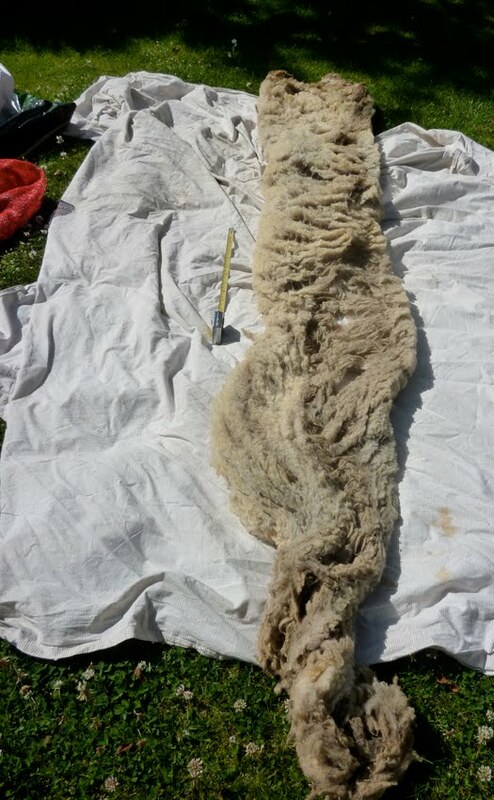 Unfolded, with gentle reminders from me that sheep have four corners, a bottom, two sides and a head, it looks like this: a very long lamb, but a lamb. The neck, stretched long, is nearest the camera. I know from my reading that the finest, cleanest, longest-staple is likely to be the base of the neck, the shoulders and down the back. The legs are likely to be muddy and have more VM (vegetable matter). The backside or britch is generally coarser, stronger wool: sheep, being sensible animals, stand with their backsides into the wind and rain so the britch bears the brunt of the weather. If it’s not properly skirted, there may be dried dung at this end, too. This is the middle of the britch, the backside. It looks surprisingly attractive, relatively clean, but the soft skin of my wrists can feel that this area is coarser than the middle of the shoulders. And there seems to be black grains of dirt and lanolin buried deep in the staples. What does the good bit look like? The staples are thinner, with more and finer crimp than the britch. There’s no dirt at the base of the staples and, when I hold my wrist to the surface, there’s no prickle at all. Here’s a staple from the britch (above) compared with one from the middle of the shoulders (below). With luck you can see the dirt at the base of the britch, the more obvious, fine crimp, and the greater length of the shoulder. 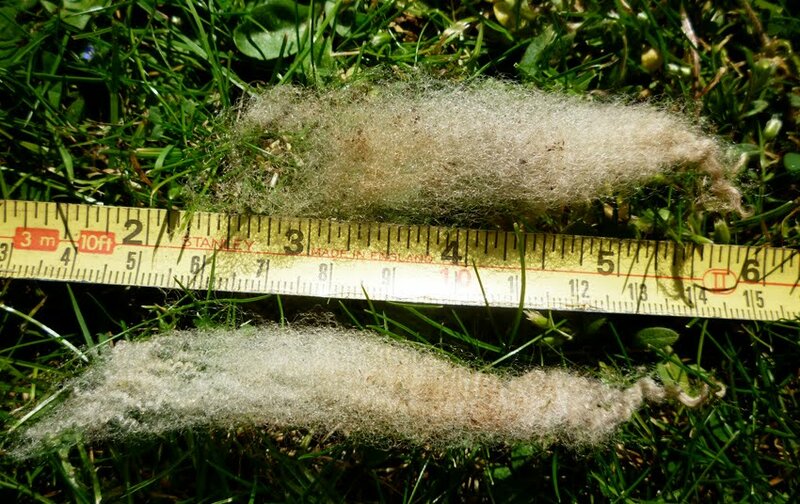 Both have lamb tips, the tightly twisted ends of the animal’s first fleece. These may be relatively dry and fragile; if so, they could break away to form nepps when carding. I have to remember to check that at some point. So it’s decision time. I have a reasonable idea of what I’ve got; what am I going to do with it? 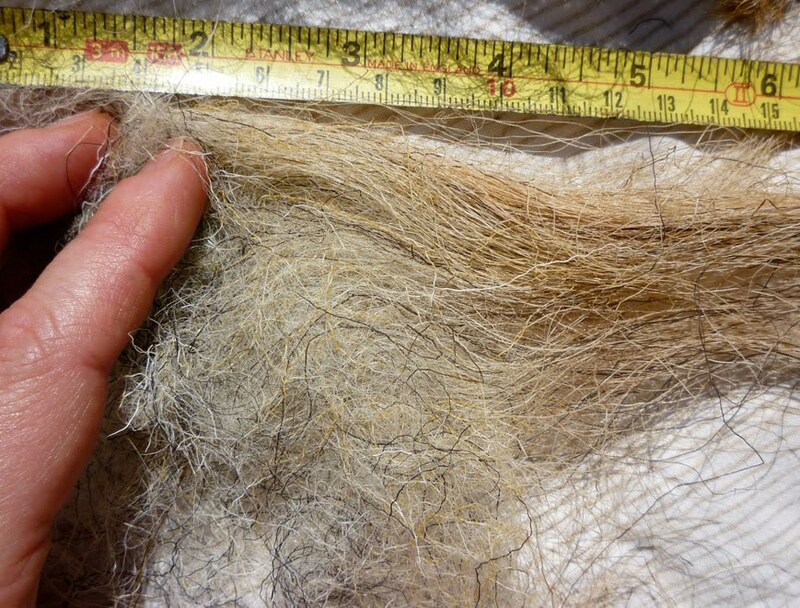 Because I want to be able to send nice clean fleece to friends, encouraging them to buy British Shetland, I’m going to put the leg fleece and more of the discoloured belly fleece to one side. I think it will clean up reasonably well, and would spin into a softish sturdy yarn. Here’s the sort of thing I’m removing, plus some of the lanolin- and dirt-matted locks above it. You should find that the fleece rips apart cleanly and easily down natural partings between the staples. 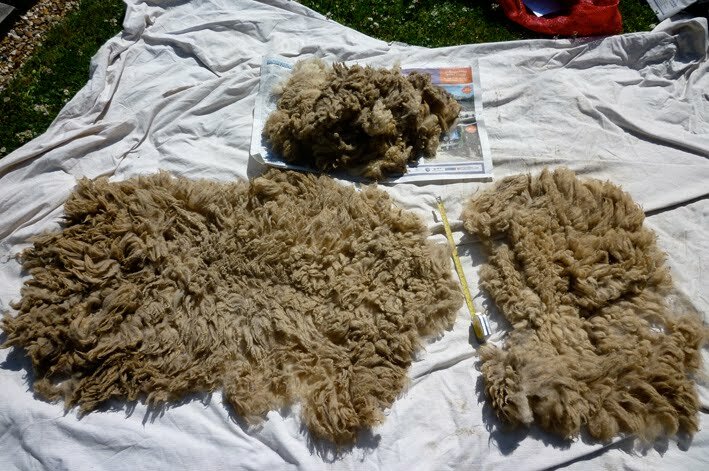 If it doesn’t, the fleece may be cotted, matted and felted on the sheep before it was sheared. This is a fatal flaw for a spinning fleece unless the staples/locks are long enough to be spun after the cotted areas are cut away. You can see the dirt driven into the fleece by the wind and rain. Sensible sheep, not putting their heads into the weather. All that’s left to do today is roll and bag the three different bits of fleece separately, each labelled with supplier, date and breed. 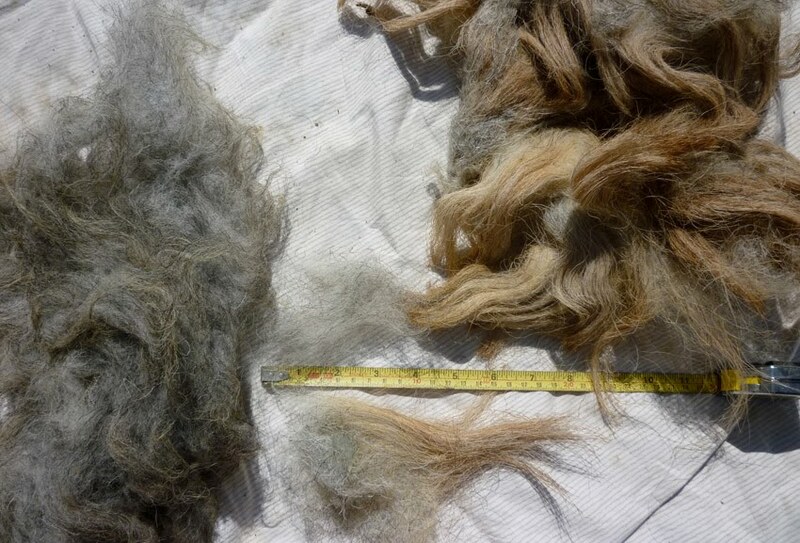 On the left, a sample of the best bit of a Herdwick fleece; to right, the britch. Herdwicks are seriously hardy sheep, bred to deal with the worst weather. 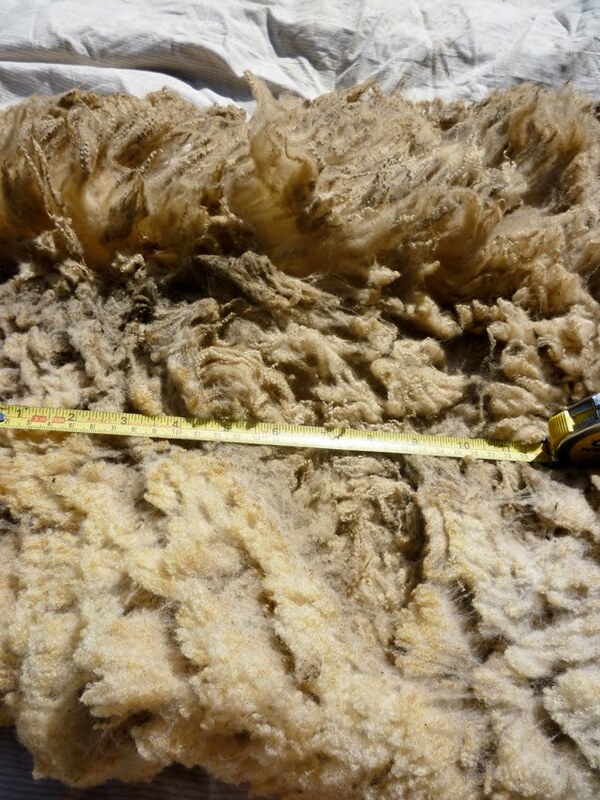 Their wool is best used for weaving and commercial carpet production. I can vouch for the fact that it makes glorious, beautiful carpets and rugs because I bought one at Woolfest. Handmade. I’ll post a picture of it next time, together with an overview of our two days of adventure in Cumbria. This entry was posted in Uncategorized on June 28, 2010 by sarahw. I wish my fleeces would unroll so tidily. Whenever I've gotten a Shetland lamb fleece, it doesn't hang together worth beans, and I have a hard time sorting it out. That is a very nice looking fleece! I bought a Wensleydale/shetland cross from the Coloured Sheep Breeders that I have yet to investigate so closely. When I do, I will have much supervision! And, pray, just how did I manage to miss you on Friday?!? Thank you for detailing this, I'm sure I will refer to it again and again. I've yet to sort the part fleece I bought at WonderWales even though the weather is perfect for it, perhaps you will be the catalyst I need to get started. Excellent tutorial. I have to confess to relying on the skirting done prior to purchase. And I agree..my shetlands seem to have no structure that I can discern. I will be tested on that this summer as I wash a black Shetland lamb. 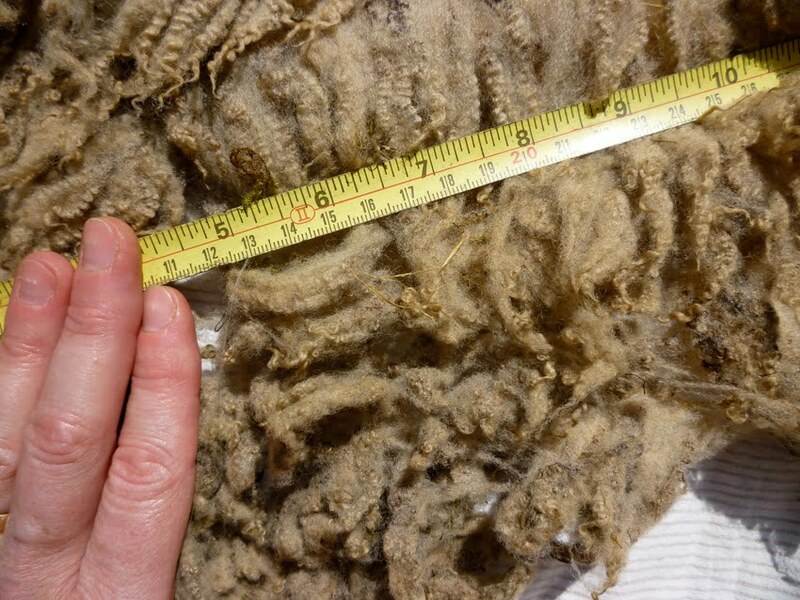 Excellent breakdown – really good looking fleece too! Wish Blarty had stayed so tidy! Please could you get in touch with me – your name was pulled out of the hat for the Summer prize draw and I don't see to be able to find an email address for you!! !